My name is Jeff Kolb. I was born in Minnesota and raised in the northwestern suburbs. I’ve lived in Maple Grove, New Hope, and now Crystal. After a few years in Arizona and Colorado for a work assignment, my wife Erin and I moved back to Minnesota in 2011. We chose to settle in Crystal because we knew it would be a great place to raise our family. Our son, James, was born in August 2013. We are very lucky that his grandparents are also Crystal residents, and only live about 6 blocks away! I am a small business owner, a board member with the Crystal Business Association, and I currently represent Ward 2 on Crystal’s Planning Commission. My wife is the Vice Chair of Crystal’s Parks Commission and a member of the Crystal Crime Prevention Board. 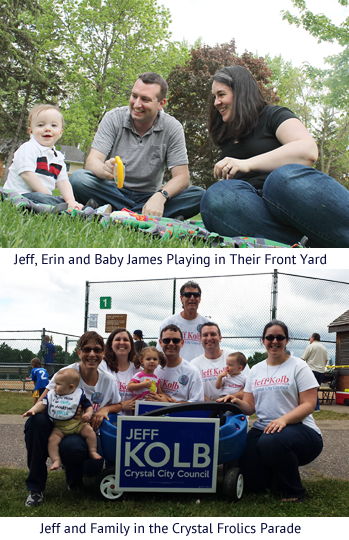 When we chose to raise our family in Crystal, we wanted to make sure we were involved in making our community better. I am running for City Council because Crystal is a great place to live, but I also recognize there are things we could do better. I want to make sure that we keep Crystal a great place to live, work and shop, and if I am elected, I look forward to continuing to serve our community. Crystal’s Ward 2 encompasses three precincts south of 45th Avenue and north of 34th Avenue. Ward 2 includes all or part of the Brownwood, Fair, Forest, Welcome Park, Valley Place, Basset Creek, Lee Park, and Winnetka Hills neighborhoods. City Hall, the Hennepin County Library, and West Metro Fire-Rescue Station 2 are located in Ward 2. The business districts at Douglas Drive and 42nd Avenue (Almsted’s), along Douglas Drive (Milton’s, Pizza Hut, Aquatropics) and along 36th Avenue toward Robbinsdale (Cub Foods) are also part of Ward 2. To look up your precinct, click here.